Although I have practiced in numerous jurisdictions and areas of the law, I have always been drawn to family law and assisting injured persons. It is very rewarding to help people find solutions to some of the most challenging and emotional problems in their lives. 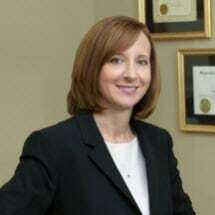 Some of my most rewarding experiences as a lawyer center around simple accomplishments like obtaining benefits for an injured worker or relieving a client's worries about the complications of divorce and custody litigation just by simply being there to listen and give advice well before anything even happens at the courthouse. I have tried hundreds of cases in courtrooms spanning three different states and numerous counties within those states. It is my personal and professional goal to provide quality representation, excellent communication and personal attention to all of my clients and cases no matter how simple or complex. I am from Tennessee and received my undergraduate and law degrees from the University of Tennessee, but I have also practiced law in Mississippi and Indiana. In 2007, I moved back to Tennessee with my husband, Scott, and our two young children to be closer to our families and closer to the mountains of East Tennessee. Ever since, I have been proud to be a part of the team here at Costner & Greene.